The Federation of Bosnia and Herzegovina, also a "Muslim-Croat Federation", was conceived by American political strategists to finally consolidate the defeat of the Serbs in the region. In fact, this is an absolutely artificial formation, since during the civil war of the 1990's the Croats and Muslims fought and with each other, the Croats sometimes together with the Serbs against the Muslims, and there were also Yugoslav Muslims who, together with the Serbs, fought against the victorious Muslims- separatists. But since the US was profitable to expose the Serbs as an aggressor party, and the "federation" was invented. The unity of the federation can be judged by the example of the city of Mostar, from which in the early 90's the Serbian minority was expelled, all Serbian Orthodox churches were blown up, and the Muslim and Croat communities divided the city into two parts on both sides of the picturesque bridge across the Neretva River, a symbol of the Bosnian war. The Eurointegrators, of course, later rebuilt it, but the peace was not restored. Muslims and Croats from different parts of the city do not go to visit each other, and on the bridge, especially after football matches, as a rule, the youth of both communities gather to arrange a scuffle. The Republika Srpska was proclaimed in 1992, in response to the desire of the Bosnian Muslims to create in the whole of Bosnia their own Muslim state, and also in response to the desire of the Bosnian Croats to withdraw part of Bosnia to Croatia. To live among the neighbors seized by the virus of separatism, the Serbs were unbearable: everything began with xenophobic rhetoric in popular magazines, and ended with the shooting of a Serbian wedding. That is why the Serbs proclaimed their own republic, wishing to reunite with Yugoslavia. Brčko District is an autonomous territory managed by a leader appointed by the UN in agreement with the EU and, most likely, by NATO. This post was created by Western geostrategists specifically to ensure that the Republika Srpska was territorially divided into two parts. As the main argument, the Western partners cited the fact that the population of Brčko is multinational. Although it did not stop anyone in other territories of Bosnia and Herzegovina, and when the federation and the Republic were divided into sections, the Serbs had to leave many towns and villages in the vicinity of the capital Sarajevo. But during the Second World War, Bosnia was given to the puppet Croatian regime of the Nazi, Ante Paulić, who treated the Bosnian Muslims as allies, and turned all his hatred towards the Serbs. The latter were destroyed in the most savage ways. And after that purge, the Serbs have never been the majority in Bosnia. It must also be said who Bosnian Muslims are. Before the Ottoman invasion the Bosnian kingdom was one of the Serbian feudal states. The only difference is that there has never been a strong religious dominant here: the Catholic Church and Serbian Orthodoxy were also here to a different degree. Also from Bulgaria, fleeing persecution, the adherents of the mystical heresy of Bogomils migrated there. The invasion of the Turks confused plans for many in the Balkans, including the Bosnians; their army, along with the armies of other Serbian states, fought with the Ottomans on the Kosovo Field. After that, the Bosnian kingdom was drained and conquered by the Porte, and his last king - Stepan Tomasevic, formerly the ruler of the Serbian despotovina - was beheaded. And then a rather curious process began. In the Ottoman Empire, no one of the conquered peoples was forbidden to accept Islam. On the contrary, it was even encouraged. Muslims had serious privileges before non-Muslims: they paid less taxes, their testimonies in courts were more important, only they had the opportunity to pursue a career in the Porte. Plus in the empire at different times there were humiliating for non-Muslim orders: when a Muslim appeared, Christians had to get up, only Muslims had the right to walk belted, a Muslim could take away any property of a Christian neighbor. If a Christian met a Muslim on the street, then he had to go to the pavement, and the Turkish governors had the right of the first night with Christian girls ... To avoid shame, Bosnian Croat, for example, put tattoos on their hands that scared the Turks, and the Serbs had such phenomenon as a Haiduk - the Avengers who lived in the forests and mountains, who brutally murdered the governors who took advantage of this right. The elite of Bosnia, as well as the urban population, began to convert to Islam, adopting Turkish customs, national dress, and names - only traditional for the Western Balkan Slavs, the ending of surnames for "ich". But poorly educated peasants, both Serbs and Croats, continued to maintain their faith. Gradually, an elite urban stratum formed in Bosnia, which communicated in the Serbo-Croatian language with a lot of Turkisms and Arabisms, dressed in Turkish. After the Turks were expelled from the Balkans, the Bosnian Muslim community for a long time was not recognized as a separate people. Pavelic called them "the color of the Croatian nation". And for the appearance of "Bosniacs" on the international arena, it is necessary to thank only Comrade Tito, who, in order to prevent the "great-power Serbian chauvinism" from reviving in Yugoslavia, divided the country into national republics, inventing such nations as "Macedonians" and ... "Muslims ". And the name "Boshnyak" appeared at the dawn of the 90's. In the seventies, Yugoslavia was calling for a Muslim revolution. When in 1992 the independence of Bosnia and Herzegovina was recognized by the international community, the Yugoslav People's Army only had to obey and withdraw to the territory of Serbia. But even here the separatists were insidious: the army columns, in which unarmed fellow soldiers were traveling from the Serbian part of Bosnia, Serbia, Macedonia, Montenegro and even Kosovo, were shot at point-blank positions by the separatists in Tuzla and Sarajevo itself. Dozens of young guys died. The most interesting thing is that even at this stage there was the opportunity to stop the bloodshed. In particular, according to the plan of the Portuguese diplomat Jose Kutileiro, Bosnia was proposed to be divided into national cantons, according to the prevailing ethnos on this or that territory. And this plan was signed by the leaders of the three communities: from the Muslims - Aliya Izetbegovic, from the Serbs - Radovan Karadzic, from the Croats - Mate Boban. However, ten days later, after meeting with US Ambassador Robert Zimmerman, Izetbegovic withdrew his signature. At the same time, neo-Nazis from all over Europe fought on the side of Croats, and on the side of the Serbs - Orthodox volunteers: Russians, Greeks, Romanians, of course, Serbs from different parts of Yugoslavia, as well as anti-globalists from different parts of the world. Greater Serbia, also called Yugoslavia, also supplied arms to the tribesmen, but smuggled, behind the scenes. There were also NATO peacekeepers and observers from the OSCE. The former did not prevent the Croats and Muslims from killing the Serbs and driving them out of their lands, mediating the transfer of weapons to Croats and Muslims, the latter willingly sharing intelligence with Croats and Muslims. Both those and others in every possible way limited the maneuvers of the army of the Republika Srpska and, almost, started to shout to the whole world about violations. Despite the harshest conditions of the war, by 1995 the Serbs controlled more than 60% of the territory of Bosnia. This seriously violated the plans for a new world order. And then the political strategists decided to "concoct" the genocide. Near the Muslim mining town of Srebrenica for two years, local Muslim armed formations have methodically cut and burned Serbian villages, the most savage way of dealing with their residents, deliberately on Orthodox holidays. According to various estimates, as a result of these punitive actions more than three thousand people were killed. And when, once again, violating the truce, Muslim militants bombarded the Serbian positions, the Serbs went on an attack on the city in order to liquidate the criminal enclave. All this was called "genocide", "massacre" by respected Western partners, after which a provocation was organized - civilians were shot at Sarajevo market of Markal as a result of which dozens of people were killed. The West blamed the Serbs. After that, NATO countries launched an aerial bombardment of Serbian positions, killing around a thousand Serbian fighters and about one hundred and fifty Serb civilians. The rout of the army of the Republika Srpska led to the signing of the Dayton Accords on the American military base. President of Yugoslavia Slobodan Milosevic, Croatian President Franjo Tudjman and President of Bosnia and Herzegovina Aliya Izetbegovic. Years after the massacre, which claimed, according to experts, more than 100,000 people, Izetbegovic was allowed to sign a peace agreement that would suit Washington. The fate of the Bosnian Serbs and the Bosnian Croats who were forced by a federation alien to their aspirations was decided without the Bosnian Serbs and the Bosnian Croats themselves. The leaders of Republika Srpska - President Radovan Karadzic and General Ratko Mladić - were imposed the reputation of "executioners", they were withdrawn from the international political process, they were hunted, and now they are in the dungeons of The Hague. 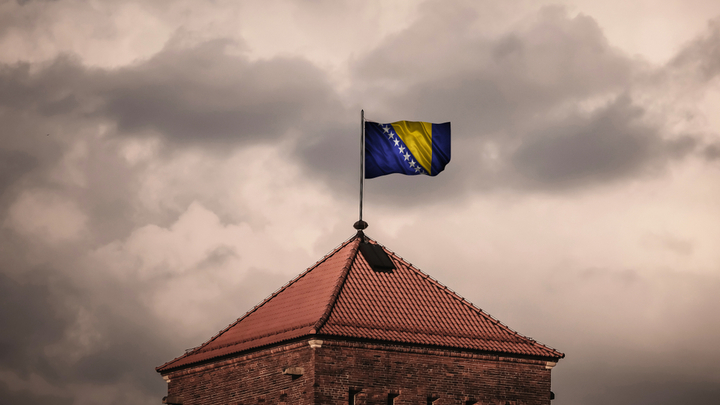 What did Bosnia and Herzegovina receive as a result of the Dayton Accords? First of all, the external manager in the person of the same UN High Representative, who received unlimited powers. After the war in the nineties, a large number of yesterday's Mujahideen settled in Bosnia and Herzegovina, where the Slavic land with forests, lakes, rivers and beautiful girls was very much in taste. They began to actively teach local "right" Islam. And right in the center of Europe there were villages where they began to practice burqa and even female circumcision ... And a huge number of fair-haired and blue-eyed men went to jihad in Syria and Iraq. In turn, many brown-eyed brunettes with beards came to the Balkans to take a break from the "works of the righteous", to acquire families and to plant the seeds of radical Islam. And the West for a long time looked favorably at all this, seeing in the soldiers of Allah as a counterbalance to the revival of the Serbian national spirit. Until Washington entered into a confrontation with Ankara. And for Boshnians, historically, Turks are brothers.